Welcome to After Trauma, a website that connects and supports survivors of traumatic injury and their families. After Trauma aims to provide a community for patients and families to rebuild lives and support each other after experiencing a traumatic injury. 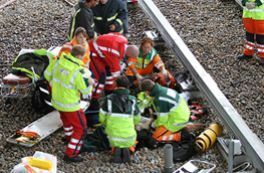 Traumatic injury is caused by various forces from outside of the body, which can either be blunt or penetrating (sharp). Information about rehabilitation, caring for someone with a traumatic injury, getting back to work and more. We survived trauma. Become part of the community and help others like yourself. Many trauma survivors share their stories and videos on this website. Ella's video shows how trauma can happen to anyone, anytime. She describes the impact of the accident that resulted in her leg amputation. 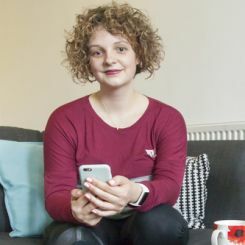 Ella is also an ambassador for Barts Charity's Transform Trauma awareness and fundraising campaign. Has your life been touched by traumatic injury or bereavement? 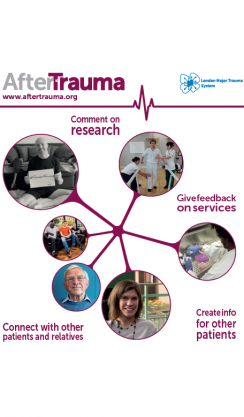 You can be involved in AfterTrauma in many ways - connecting with other trauma survivors, helping with research, giving feedback about trauma services, fundraising and much more.